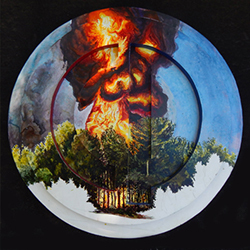 Genesis Chapman, Winner of Taubman's First Triennial, Opens Solo Exhibition "Fire on the Mountain"
ROANOKE, Va. (March 10, 2018) — The Taubman Museum of Art is pleased to present Genesis Chapman: Fire on the Mountain, a new solo exhibition by the Museum’s first juried triennial winner, Genesis Chapman. The series documents the environmental impact of oil and gas pipelines across the United States, and reflects Chapman’s personal struggle with the proposed Mountain Valley Pipeline, which will cross his homeland in Bent Mountain, Va., in several places. The exhibition is on view March 10-Aug. 12, 2018, and is free and open to the public. Chapman will give artist talks Friday, April 6, at 4:30 p.m. and 6:30 p.m. The talks are $8 for the general public, $5 for students and educators, and free for members. ROANOKE, Va. (Feb. 9, 2018) — After a nearly eight month wait, Flower Bomber has finally taken flight. 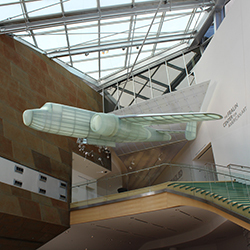 The site-specific installation by sculptor Paul Villinski is now on view through February 2019 in the City of Roanoke Atrium at the Taubman Museum of Art. Originally slated for exhibition beginning in June 2017, the rental truck carrying the work was stolen outside of Villinski’s Long Island City, N.Y., studio the night before Villinski was to drive it to Roanoke. The truck and work were recovered a few days later, only a little worse for the wear. After some repair work this past fall, Villinski debuted Flower Bomber at the Taubman Feb. 9. Representing one of the artist’s most ambitious projects undertaken to date, Flower Bomber weighs 750 pounds, has a wingspan of 30 feet and features a complex wooden structure with a skin of translucent fiberglass attached with 3,000 rivets. The work is a scaled-to-size World War II bomber airplane modeled after the North American B-25 Mitchell. Manufactured by North American Aviation (NAA), it is named in honor of Major General William “Billy” Mitchell, a legend of U.S. military aviation. 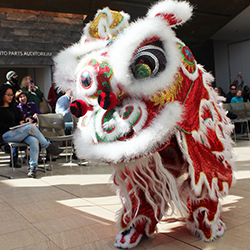 ROANOKE, Va. (Jan. 29, 2018) —The Taubman Museum of Art, Local Colors and Roanoke Valley Sister Cities invite the community to celebrate Lunar New Year Saturday, Feb. 3, 12-2 p.m. at the Taubman Museum of Art, 110 Salem Ave. SE. Lunar New Year is a special celebration recognized by Asian communities throughout the world, and is a time when families mark the changing of the traditional Chinese calendar with special foods, gifts and customs. The upcoming year is the Year of the Dog, the eleventh of 12 signs that make up the Chinese zodiac. 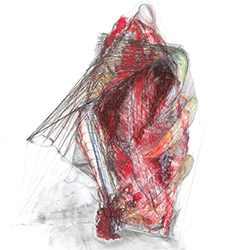 ROANOKE, Va. (Jan. 19, 2018) — The Taubman Museum of Art is pleased to present NoTiNoRdeR, an exhibition of mixed media drawings and assemblage sculptures by California artist Joan Tanner, on view Jan. 19-June 17, 2018, in the Bank of America Foundation/Dominion Resources Gallery. The exhibition is organized by Julien Robson, independent curator and director of Great Meadows Foundation. “Joan is compelled by a curiosity to engage contradiction and an impulse to disrupt assumptions about spatial relations,” noted Robson. NoTiNoRdeR provides an opportunity for audiences to explore and enjoy the inventiveness of Tanner's art, and take pleasure in the play of imagination it evokes. Over a career spanning six decades, Tanner's art has developed across disciplines to encompass many media, including painting, photography, video, sculpture and assemblage. With an instinctive resistance to conventional ideas of order, she has created provocative and engaging works that defy simple categorization and sometimes logic. 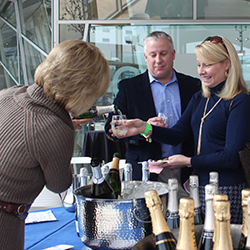 ROANOKE, Va. (Jan. 15, 2018) — The Taubman Museum of Art is pleased to present the Second Annual Tastings at the Taubman, a trio of delicious events celebrating the art of fine wines and craft spirits. USA Today recently named the series among the coolest food and beverage festivals in the United States. Featuring a Spanish theme, Wine + Dine on Thursday, January 18, begins with a guided tour of the galleries with exhibiting artist Joan Tanner. Guests then retreat to an intimate theater for a guided, five-course dining experience with Pablo Rodriguez, the third generation vineyard owner of the acclaimed Hispano Bodegas vineyards. Tickets are $110 each, and advance registration is required. Guests can sample more than 30 wines from around the world (along with a few craft beers!) while they enjoy live music and expertly paired hors d'oeuvres and desserts at the Fifth Annual International Wine Festival presented by Kroger on Sunday, January 28. Seasoned wine stewards will enhance guests’ experiences with tasting notes to help them discover their favorite new wines. Coca-Cola will provide a designated driver service after the festival to those who are within a 15-minute radius of the Museum. Tickets are $45 in advance and $55 the day of the event.